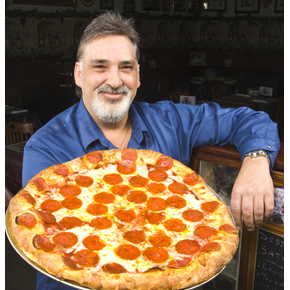 Mr. G's offers a huge selection of gourmet pizzas. In fact, they're SO good, they were featured in the hit movie "More Than a Game," featuring Lebron James. Mr. G's also offers a variety of homemade soups, including pasta fagioli, chicken dumpling, and wedding soup. Pizza by the sheet is available for same day delivery or pick-up. Ask about corporate or personal catering, including pans of pasta and gourmet salads serving 20-25 people. Mon. & Tues. 4 p.m. – 10 p.m.
Wed. & Thurs. 11:30 a.m. – 10 p.m.
Friday & Sat. 11:30 a.m. – 11 p.m.
Sun. 12 p.m. – 10 p.m.